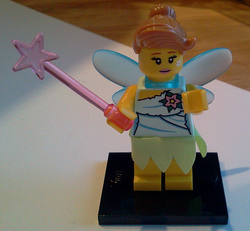 The Fairy is a Minifigures minifigure released in 2012. She will also appear in LEGO Minifigures Online. The Fairy has light brown wavey hair in a bun at the back. She has a yellow head with black eyes with white pupils and black eyelashes, a smiling face with pink lipstick she also has a white flower painted on her cheek. She has trans blue wings over her light blue torso, she wears a light blue dress with a pink flower with dark green leaves. She has yellow arms and hands. She wears a light green leavey skirt over her legs,she has light blue hips, her legs are mostly yellow but has light blue swimsuit bottom at the top. She carries a trans pink wand. To say that the well-meaning Fairy is a little bit confused would be an understatement. She spends so much time flying to and fro (not to mention up, down, over and under) that she occasionally gets her thoughts a little bit jumbled-up. And she’s just so carefree that she’s even forgotten what kind of fairy she’s supposed to be! Is she a fairy godmother? A tooth fairy? One of those fairies who flits around meadows making dewdrops appear and flowers bloom? She tries being all of them, but she keeps mixing up what she’s supposed to do. She’s granted wishes to frogs (they wanted flies), left glass slippers under pillows (fortunately, they were very strong slippers) and transformed rocks into handsome princes (they mostly just sat around). Fortunately, thanks to the laws of fairy magic, no matter how mixed-up she may get – with a wave of her magic wand and a flutter of her wings, there’s always a happy ending! This page was last edited on 11 July 2016, at 23:39.